What do actress Chandra Currelley, bestselling authors Jackie Collins, Kimberla Lawson Roby and Wally Lamb, actors Isaiah Washington, Philip K. Boyd, Kim Coates and Jamie Kennedy as well as comedians Cocoa Brown and Rodney Perry and media personality Leeza Gibbons all have in common? They all made a choice to live life on purpose. 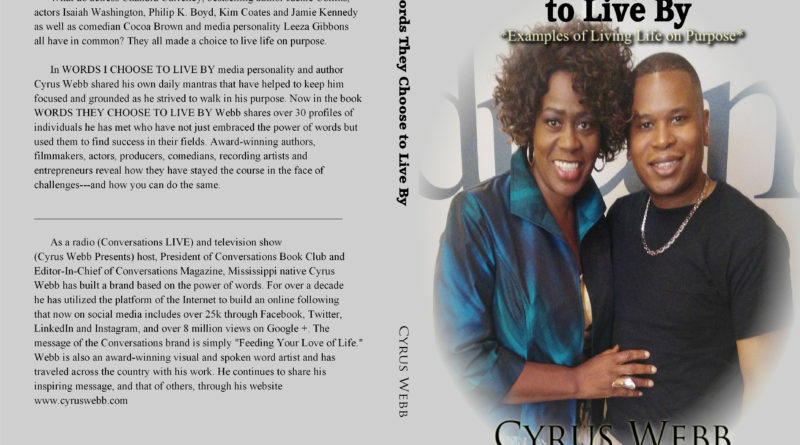 In his first inspirational book WORDS I CHOOSE TO LIVE BY media personality and author Cyrus Webb shared with you his own daily mantras that have helped to keep him focused and grounded as he was striving to walk in his purpose. Now he is excited to announce that in his new book WORDS THEY CHOOSE TO LIVE BY he’s sharing over 30 profiles of individuals he has met and interviewed who have not just embraced the power of words but used them to find success in their fields. Award-winning authors, filmmakers, actors, producers, comedians, recording artists and entrepreneurs reveal how they have stayed the course in the face of challenges—and how you can do the same. 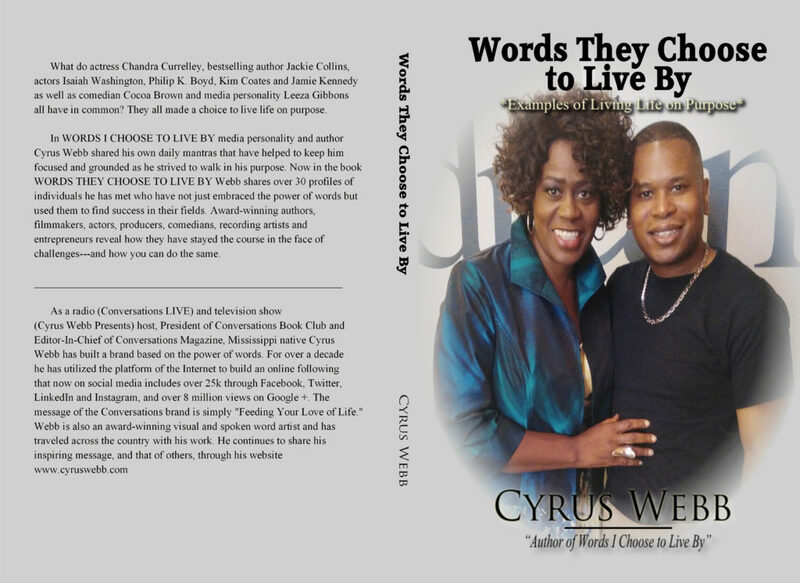 WORDS THEY CHOOSE TO LIVE BY (featuring Webb and actress/recording artist Chandra Currelley of the hit show FOR BETTER OR WORSE on the Oprah Winfrey Network on the cover) is being published through Conversations Media Group and will be available on Amazon.com Tues. May 30th, HOWEVER, as supporters of Webb you can now reserve your AUTOGRAPHED copy and get it early through www.cyruswebb.com. 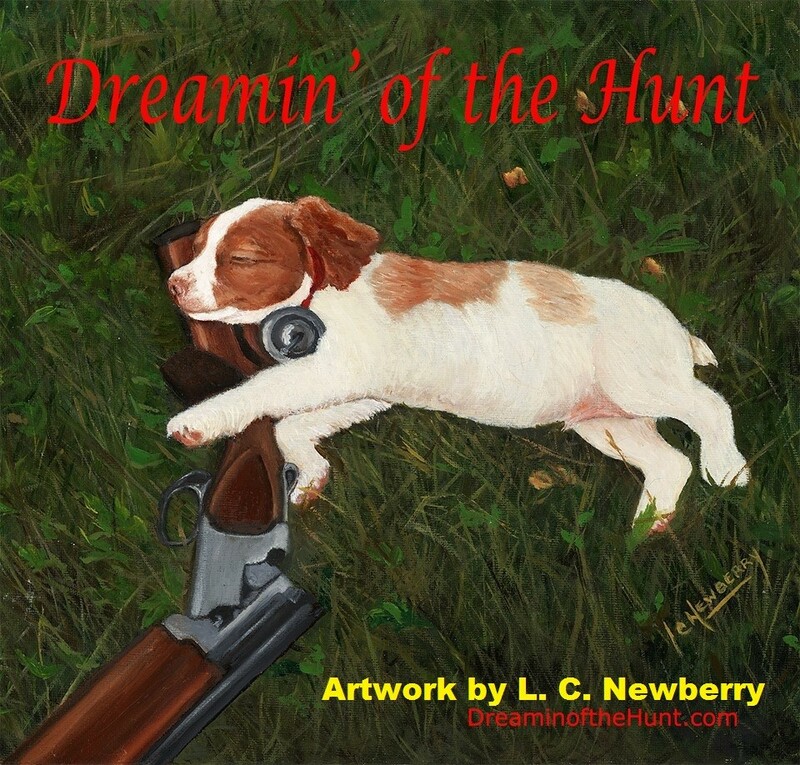 The book retails for $15.00, however, through this special Webb is running through Friday, April 14th you can get the book for $15.00, SHIPPING INCLUDED! All you have to do is click the Paypal link below and when you make your purchase LET ME KNOW IN THE COMMENT SECTION who to make the book out to! All autographed copies ordered BY FRIDAY, APRIL 14TH will mailed out on Tues. May 2nd. Need to purchase more than one copy? Email Webb at cawebb4@juno.com with your request, and he will have a special Paypal invoice created for your order.